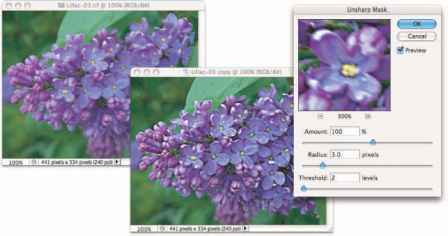 Photoshop has a number of filters that you can use on just about any image to improve or finesse it. Most photos, for example, benefit from at least a little bit of sharpening to improve the detail in the image. In some cases, you want to decrease the visible detail in an image in areas to hide defects, or perhaps you blur a background to draw more attention to the subject of your shot. And Photoshop CS2 has a couple of new filters that you'll find handy for correcting lens distortion and reducing noise (specks of red, green, and blue) in digital photos. You can instantly reapply the last used filter exactly as it was applied with the keyboard shortcut (Mac)/Ctrl+F (Windows). If you'd like to reopen that last-used filter's dialog box to change settings before reapplying, press Option+^+F/Alt+Ctrl+F. When looking at an image, the eye is naturally drawn to certain areas first. You generally look at bright areas before dark areas and areas of detail before smoother areas in the image. Compare, for example, the three photos in Figure 15-1 (which were taken using different focal lengths and lens apertures). Using Photoshop's sharpen filters enables you to improve the detail throughout your image or in specific areas to which you want to draw attention. Figure 15-1: Blurry backgrounds help the subject stand out. Photoshop offers five sharpen filters, three of which you can ignore. The Sharpen, Sharpen More, and Sharpen Edges filters have no user-definable settings and simply work in accordance with their names. Sure, they do a good job, but you don't have that all-important control over your images! Skip them in favor of the it-takes-some-work-but-it's-worth-it sharpening filters: Unsharp Mask and the new Smart Sharpen. The Unsharp Mask filter is, indeed, a sharpening filter, despite the name (which comes from the blurry — unsharp — mask created from a copy of the image and used in the sharpening). 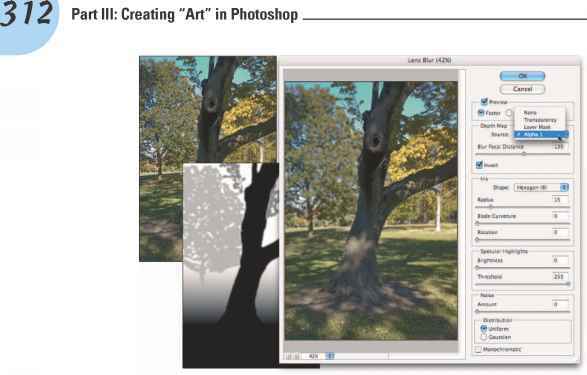 As you can see in Figure 15-2, Unsharp Mask offers three sliders to adjust the appearance of your image. Figure 15-2: Despite its name, Unsharp Mask actually sharpens your image. In the upper left, you see the original image at 100% zoom. The middle image shows the sharpening at 100% zoom. To the right is a 300% zoom in the preview area of Unsharp Mask's dialog box. Always evaluate your filters at 100% zoom even if you need to shrink the window to only a critical portion of the artwork. Zoomed in or zoomed out views might not accurately reflect the changes that you're making because the image isn't displayed with one screen pixel representing one image pixel. You can, of course, open a second view of the same image with the WindowOArrangeONew Window for [filename] command. Unsharp Mask works by identifying lines of strong contrast — the edges of elements within your image — and increases the contrast along those edges. Along the border of a dark area and a light area, Unsharp Mask uses a thin band of light and a thin band of dark to create a light and dark halo along the edges. That makes the edge appear much more defined. Here's how Unsharp Mask's sliders (as shown in Figure 15-3) work to control the effect. i Amount: The Amount slider determines how much sharpening is actually applied by controlling the brightness and darkness of the halo. An amount of 50% is often suitable for small images that are already in pretty good shape. 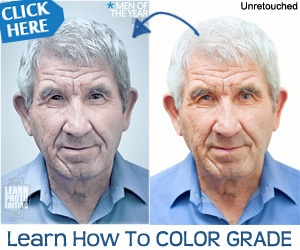 Use 100% for general photos. Use larger values, up to 500%, for special effects. i Radius: Use the Radius slider to determine the width of the halo. You'll typically need a value as low as 1 pixel for small images and perhaps as high as 7 for larger images that don't have a lot of tiny detail. i Threshold: The Threshold slider helps you avoid destroying your image by over-sharpening fine details. If the tiniest details in the image get wide, bright halos, they can look garish and unnatural. The higher the Threshold setting, the larger an area must be before sharpening is applied. 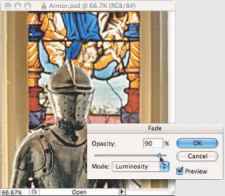 Typical Threshold settings are 2 for a small image and 5 or 7 for a large image. Figure 15-3: You adjust three sliders when sharpening with Unsharp Mask. The new Photoshop CS2 Smart Sharpen filter provides you with an incredible amount of control over the sharpening process. Although it won't (quite) be able to give you a crisp image of that bank robber from the pixelated, blurry surveillance camera (that only happens on TV), it will help you improve just about any image. Those who photograph through microscopes and telescopes might find this filter particularly useful. 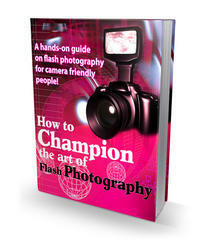 However, remember that although you might improve an image, some blurs won't be removed by sharpening. Figure 15-4 shows how well Smart Sharpen works with an appropriate image In this image, the blurring is consistent throughout the subject of the shot, and there is a reasonable amount of blur. Note in Figure 15-4 that when you select the Advanced radio button, you get a pair of new tabs in the dialog box: namely, Shadow and Highlight. Use those tabs to control how strongly the effect is applied in the darker and lighter parts of the tonal range. 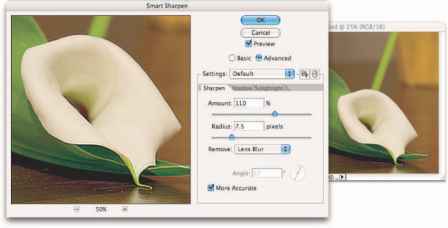 Smart Sharpen also enables you to specify any of three types of blurring that can be plaguing your image: Gaussian Blur (a uniform blur), Lens Blur (areas of blur beyond the focal distance of the lens), and Motion Blur (the subject or camera moving while the shot was taken). If you don't see distinct evidence of lens blur or motion blur, stick with Gaussian blur. Photoshop's tools, you can adjust the effect with the Fade command, found under the Edit menu. I With Fade, you can reduce the opacity of the previous command or tool, thus reducing its impact on your image. You can also change the blending mode, which alters how the command or tool interacts with pixel colors prior to your change. Say, for example, you paint a black stroke with the Brush tool set to Normal and 100% opacity. Immediately afterward, you go to the Edit menu and select the Fade Brush command. You can then pick a new blending mode and/or reduce the opacity setting, which changes the painted stroke to appear as if you'd selected the new settings in the Options bar before painting. I You can also apply the Unsharp Mask filter and then select the EditOFade Unsharp Mask command, as shown in the figure here. (Yes, the Fade command changes names automatically!) In the Fade dialog box, changing the blending mode from Normal to Luminosity ensures that your Unsharp Mask filter doesn't alter the color of pixels along edges. Using the Fade command this way is the same as if you'd switched to Lab color mode and sharpened only the L channel — without having to switch color modes at all. Figure 15-4: Smart Sharpen does a great job with appropriate images. 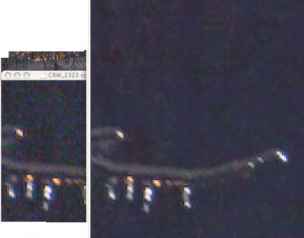 As you can see in Figure 15-1, blurred areas in an image attract less attention than do the sharper parts of the photo. By making a selection, you can selectively apply Photoshop's blur filters. You can also use the blur filters to hide flaws in an image, including dust, noise, and unwanted little bits and pieces in the picture. You might also want to blur all or part of an image prior to using some of the artistic filters available in the Filter Gallery (which I discuss later in this chapter). Photoshop CS2 provides you with almost a dozen different blur filters, including three brand new blur filters. Although you'll eventually develop a special fondness for one or two blur filters, it's good to know how each of them works. Table 15-1 gives a quick overview of the available filters. Average This filter looks at each of the pixels in the selection, determines the average color value, and then assigns that color to all the pixels in the selection, producing an area of solid color. Changing the opacity or blending mode with the EditOFade Average command afterward softens the averaging to the point where it's more useful. Blur The Blur filter applies a slight blur throughout the image or selection. Apply the Blur filter and then use the shortcut 8€+F/Ctrl+F to reapply the filter numerous times to make the effect stronger. Blur More Blur More is simply a stronger version of the basic Blur filter. Box Blur New in Photoshop CS2, this filter blurs the image vertically and horizontally; you see the effect most noticeably in small highlights that tend to bloom into squares. In the Box Blur dialog box, you control the filter with a Radius slider. Gaussian This filter produces a smoothly Blur blurred version of your image without the distracting artifacts and lines you get by repeatedly applying the Blur More filter. Get more control over the blurring effect by using a Radius slider that lets you control the amount of blurring. This filter simulates the effect in which the camera's zoom and aperture create a sharp foreground and a blurry background. Use an alpha channel (a saved selection) to determine where and how strongly the filter is applied. For a look at the Lens Blur filter in action, see Figure 15-5. This filter lets you choose any angle and a wide range of distances (measured in pixels) to suggest motion for all or part of an image. Use it without a selection to produce the illusion that the camera (not the subject) was in motion. Make a selection and copy it to a new layer to blur just that part. An incredibly powerful, yet incredibly flawed, tool that blurs in a spinning motion around a center point in your image or selection, or simulates zooming in on that point. With no preview available, you have no idea what settings are appropriate for your image (and artistic vision) without trial and error. The Shape Blur filter (new in CS2) uses a Radius slider and one of the shapes from your Shapes palette as a pattern for the blur. You can load additional shapes by using the small black triangle at the upper right of the shapes area. Smart Blur Controls the blur by recognizing Use Smart Blur in Normal mode edges (areas of extreme differ- to eliminate all fine detail in your ence along a line of pixels) image, use it again in Edge Only and blurring within those areas. mode to trace edges in the image, and then use the shortcut ^+I/Ctrl+I to invert the image, which produces a black-on-white sketch of your original. Much like working with the Unsharp Mask filter, you use a Radius slider to determine the amount of change and a Threshold slider to exempt some areas of the image from the change. Figure 15-5: Lens Blur can use an alpha channel (mask) to control the blur. Figure 15-6: Surface Blur blurs areas of similar color, preserving fine detail in the image. The new Photoshop CS2 Lens Correction filter (find it in the Distort filters) does a wonderful job of cleaning up pin cushioning and barrel distortion (the outer edges of your image appear to bend inward or outward, respectively). You'll see pin cushioning when shooting with a telephoto lens at its max zoom and barrel distortion at the lens's lower magnification. Both are most obvious when the photo has what should be straight lines at the edges. 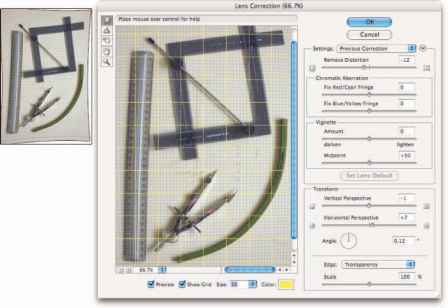 You can also use Lens Correction to adjust the vertical or horizontal plane of an image. In Figure 15-7, you see the Lens Correction window, a rather complex working environment. Figure 15-7: Fix barrel distortion, pin cushioning, and perspective with Lens Correction. I Remove Distortion (top): Select this tool to drag in the preview area to adjust the distortion factor. I Straighten (second): This tool is simple: Click and drag along any line in the image that should be straight, and the image is straightened! i Drag Grid (middle): Use this to reposition the grid overlay, aligning it with the content of your image. i Hand and Zoom: The lower pair of tools should look familiar. The Hand and Zoom tools function as they do anywhere in Photoshop: When the image doesn't fit in the window, click and drag with the Hand tool to reposition; click the Zoom tool to zoom in, Option/Alt-click to zoom out. You'll also find i Remove Distortion slider: The Remove Distortion slider is the heart of this filter. You use this to compensate for pin cushioning or barrel distortion in the image. Drag it back and forth until your image's vertical and horizontal lines are straight throughout the image. 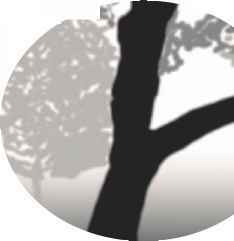 i Chromatic Aberration sliders: Sometimes a photograph shows distorted color along fine angular lines, such as the branches of trees or latticework. You can minimize these colored halos or fringes with the Chromatic Aberration sliders. Generally speaking, you want to zoom in close on a specific area of detail to make the adjustment. i Vignette sliders: Drag the Amount slider to the left to add a dark vignette (fading along the outer edges of the image) or to the right for a white vignette. The Midpoint slider increases and decreases the amount of shadowing or highlight along the edges. i Transform controls: Use the Vertical Perspective and Horizontal Perspective sliders to make your image appear parallel to the viewer. Much like using the perspective crop option or the EditOTransformO Perspective command, you're changing the perceived angle of the image to the viewer. i Saving and loading settings: From the Lens Correction window's menu (to the right of the Settings pop-up menu), you can save (and later load) settings. Because you can name the settings, you can save a set for each of your lenses, at each of their zoom factors, and apply the same correction easily, time after time. Although Lens Correction is designed to fix images, there is no reason why you couldn't use it for special effects. For example, rather than using the Perspective command, you can use the Vertical Perspective and Horizontal Perspective sliders in Lens Correction, and perhaps add some barrel distortion as you would with the DistortOPinch filter. Digital noise — those annoying red, green, and blue specks in your image — can ruin an otherwise lovely picture. (To avoid noise, make sure that your camera is set to shoot at the lowest ISO setting possible.) Photoshop CS2 adds a new filter for reducing (not necessarily eliminating) digital noise in your images. Found under the FilterONoise menu, Reduce Noise can do an excellent job of minimizing the random red, green, and blue pixels in your image, as you can see in Figure 15-8. Figure 15-8: Reduce Noise neutralizes the red, green, and blue specks in a digital image. When you work with Raw images, do all your noise correction in the Camera Raw plug-in (see Chapter 7). For images in formats other than Raw, use the Reduce Noise filter. 1. Set the details sliders to 0 (zero). In the Reduce Noise dialog box, drag the Preserve Details and Sharpen Details sliders all the way to the left. This eliminates any interference with the actual noise reduction. Use the Reduce Color Noise slider to minimize the red, green, and blue specks in your image. Drag the slider slowly to the right until the color noise is gone. Increase the Sharpen Details slider 1% at a time until the color noise returns; then back off 1%. Drag the Preserve Details slider to the right until you have a good balance between image detail and any luminance noise (bright and dark specks) in the image. In Figure 15-8, the distant trees are unlighted, yet some of their detail can be retained with Preserve Details. If you see noise of one color considerably longer than the others when dragging the Reduce Color Noise slider, click the Advanced button near the top of the dialog box and work with each channel individually, according to its needs. Also note the Remove JPEG Artifact check box at the bottom of the window. If your image is suffering from JPEG compression problems, selecting that check box might help relieve the effects. (JPEG compression often results in visible borders between 8 x 8 pixels squares within your image.) Remember, too, that you can use the button to the right of the Settings popup menu to save your correction for future use — it will be added to the Setting menu.